As a machinist and designer, I do a lot of technical drawing and design sketching. I'm naturally very picky when it comes to the pens I use. I have found my lifelong favorite pen, the Pilot G-2 0.38. I do all of my sketching with this pen and I absolutely love it. 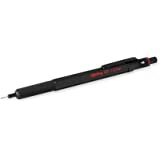 However, I wanted something a little tougher and luxurious, which is when I discovered rOtring. 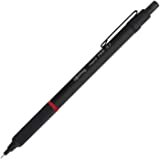 I read the history of the rOtring pens and decided to order one, I ordered this pen and also a mechanical pencil. First impressions matter a lot to me and the way these are packaged is great. They come in a small triangular cardboard box, I loved opening it to reveal my new pen. A+ on package design. 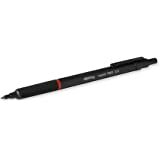 The look and feel of the pen is outstanding, metal body construction with plastic internals. Yes I know the plastic internals seem cheap, but every other pen I have ever used has been plastic. It's not a deal breaker for me. The only gripe I have with the pen, is the way it writes, it's nothing special for me, it's just like every other ball point pen. This is where I drop a star on my review, because a $35 pen should perform better than a $0.75 Bic. I will replace the cartridge soon, hopefully I can find one with a finer point. If they made a G-2 0.38 cartridge to fit this it would be the pen I would take to my grave. All in all, I love the design, look and feel of this pen. However the pen cartridge is garbage, I feel that I could use this for a lot of writing. But for my design sketching and drawings, I'm going to keep my Pilot G-2 in my pocket. 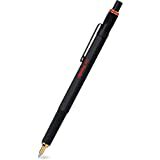 I am somewhat of a writing instrument enthusiast and I own (and love) a rOtring 600 drafting pencil along with the cheaper (and less awesome) 500. Based on my love for the 600, I decided to give the Rapid Pro a try. It's nice but not as awesome as the 600. As I have come to expect from rOtring, the knurling on the grip is fantastic. As you can see, it's not quite as pronounced as the 600 and thus not as "grippy" but possibly more comfortable if you grip your pen tightly for long periods of time. The part where the tip screws in to the body is plastic which is more like the cheaper 500 than the 600. It seems like a possible point of failure (plastic vs metal threads) but I have owned my 500 for a while now with no issues. The hex core is less pronounced than the 600 and useless because on either side of the hex section there is a round piece that is larger in diameter than the hex so it will roll around on your desk/table. Not a deal-breaker for me by any means but something to consider if you are interested in the hex core to keep your pens from rolling around. The cartridge it comes with is a nice deep blue. For me, it has a bit too much drag and I'll probably replace it with something that glides a bit easier. It would work well as an every day carry receipt signer. Luckily it's the standard Parker-style cartridge and there are a ton of options out there for replacements. Overall, I'm pretty happy with this pen. It's not as impressive as the 600, but it will make a nice addition to any desk. 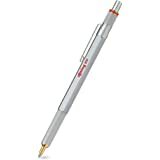 The pen still has the great feel of the older Rotrings, but the ring itself is actually part of a threaded plastic connector between the metal knurled front and metal main body of the pen. This focuses all the stresses on the plastic threaded section, making it easily broken! The pen will serve you very well so long as you never drop it or put it under flexing stress (e.g. back pocket, stuffed into a tight bag, etc.